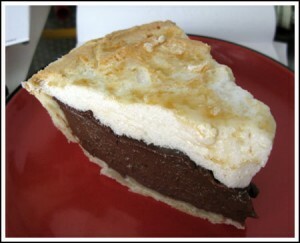 An easy chocolate cream pie with a meringue topping. I usually use a basic pastry crust, but I've included instructions for a graham cracker crust in the notes. Prep all filling ingredients, then make the meringue first so you’ll have it ready to put on a hot filling. Beat the egg whites until soft peaks form. Gradually add sugar, beating on high, until stiff peaks form. Beat in vanilla. Set aside. Mix the flour, sugar cocoa powder and salt together in a heavy saucepan. Set the pan over medium heat and gradually whisk in the hot milk. Continue whisking and cooking until mixture starts to thicken. Whisk about half cup of the milk mixture into the egg yolks, then add egg/milk mixture back to saucepan and whisk for about two minutes. It should become thick and make big bubbles. Remove from heat and whisk in butter, chocolate and vanilla. Pour hot chocolate mixture into pie shell and cover with the meringue, sealing the edges well. Set the pie on a cookie sheet and bake for 12-15 minutes. Cool at room temperature for an hour, then chill for 4 hours or until pie is set. To make a graham cracker crust, crush 1 sleeve of graham crackers to make 1 1/2 cup crumbs. Mix with 2 tablespoons of sugar and 6 tablespoons of regular salted butter (or unsalted and a tiny pinch of salt). Press into the pie plate and bake at 350 for about 8 minutes.